This review was written in early 2003 and the maps discussed are no longer available. I recently purchased a Garmin eTrex Legend GPS from GPS Central (http://www.gpscentral.ca) for use on Dual Sport motorcycle rides. This type of riding involves mainly backroads, which are only shown on maps of 1:250000 scale or better, with occasional forays into the forests using fire roads or other 2-track rarely used roads. 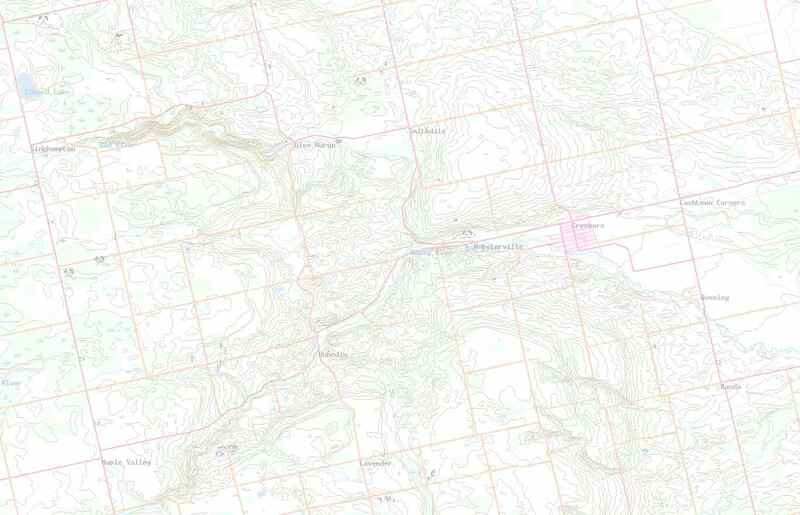 Often this latter type of track only appears on topographical maps at 1:100000 or, more usually, 1:50000. The maps pre-loaded on the GPS are totally inadequate for this type of motorcycling, as they rarely show anything less than major highways. Fortunately, many other mapping products are available and they fall into two broad groups. First, the GPS manufacturers have maps that can be uploaded only to their specific brand of GPS, and, then there are maps from other companies which generally CANNOT be uploaded to any GPS's. This second category does have an important role to play, as the data from their maps, such as road or trail intersection coordinates, usually CAN be uploaded. These coordinates, or waypoints, then merge with the GPS maps to form a "composite" map. My first efforts at using the GPS to find my location on a built-in map was with Garmin's Mapsource Canada maps. This is a series of 3 maps - MetroGuide (MG), Roads & Recreation (RR), and the Enhanced Base Map (EBM). The MG map has a high level of detail for Vancouver, Toronto, Ottawa and Montreal, with the locations of most restaurants, gas stations, banks, etc. However, once outside these four major urban centres and the road detail is little different to the preloaded maps - i.e. useless for motorcycling. The RR map uses essentially the same road structures as MG but has recreational points of interest - campsites, etc - so is no better than MG. I was expecting the EBM to meet most of my requirements as it seemed to have the same road detail as my favourite paper map - MapArt 1:250000 backroads maps. This is where my hope started to fade! Using the EBM, I found my position at road intersections rarely corresponded with the map, many times being up to 500m in error. Switching to the MG map showed the road intersection (if I was in an urban area) to be spot on. Similar testing using the GPS to feed the position to 3rd party maps (Microsoft Streets and Trips, SoftMap Topo50/GPS, etc) using real-time navigation, showed the GPS to be putting us right at the correct point on the map. My preliminary conclusion was disheartening - the EBM was NOT going to be accurate enough to pre-plan a ride, upload the route to a GPS, and then expect those unfamiliar with the roads to navigate from the uploaded route.